These Doughnuts were actually a request from a friend who wanted these for her birthday. When we visited a food fair in Vienna last month we came across a doughnut company that made insanely tasty doughnuts in all kinds of flavours that simply reminded you of American style doughnuts and so calorie rich you simply felt guilty eating them. My try to make these Doughnuts healthy simply did not succeed. However I must say that they have the less sugar in them than many other recipes I have posted here. The dough itself is a simple yeast dough containing only two Spoons of sugar and here its really up to you what kind of sugar you want to use. I used my favourite sugar alternative that I love for baking, which is Xylitol sugar or Birch sugar. Im never quite sure how the English speaking folks actually call this sugar :). The Matcha - White Chocolate Glaze comes from a recipe I posted last year. There I made Matcha & White Chocolate Cookies that tasted insanely good. They were an absolute hit with family and friends which is way I then decided to sell them at a food fair in Vienna were I participated in. Surprisingly no one wanted to buy them, which we thought was due to the intense green color which looked a bit to healthy for the average bakery eater. 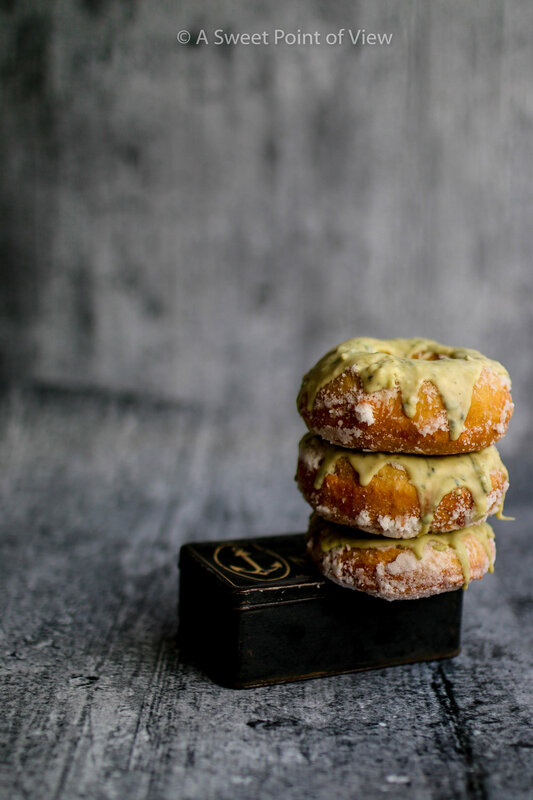 So if your into healthy looking but not that healthy after all bakeries, these Machta - White Chocolate Doughnuts are absolutely right for you. Mix the yeast with the water and let it stand for 2 hours. Then mix the flour and the yeast/water mixture and let the dough sit for 6 hours or over night. Knead the dough once again and roll it out. Start cutting out round pieces that are at least 3 cm thick. Fill a saucepan with some Oil and heat it up. Then place one doughnut at a time in the saucepan and bake each side until golden brown. Then put doughnut in the vanilla/sugar mixture and let it cool. 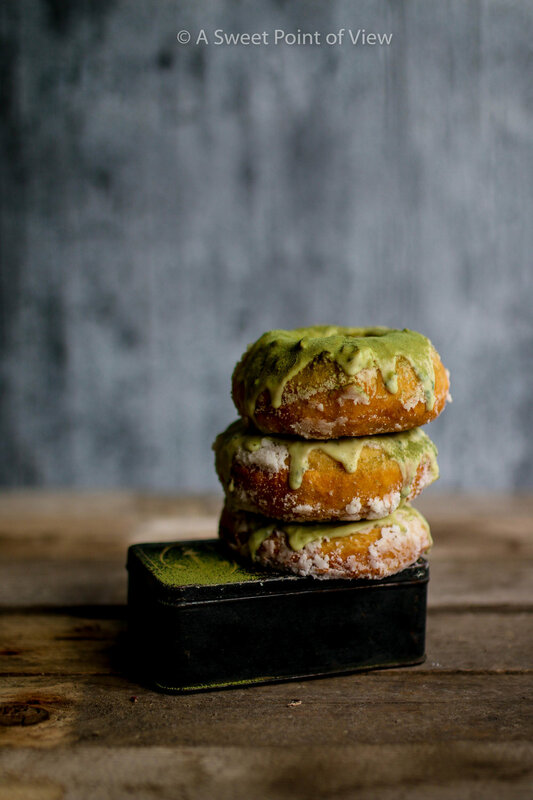 Melt white chocolate and add 1 teaspoon of Matcha and glaze the doughnuts with this.